With all the Windows Phone 10 rumors going around, there was speculation that Microsoft will focus on bringing the major update and skip over the smaller WP8.1 GDR2 update. 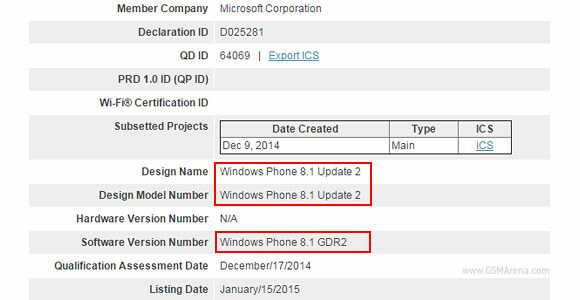 That seems to have been wrong as the Bluetooth SIG had issued a certification for "Windows Phone 8.1 Update 2," aka GDR2, about a month ago. The new minor update is supposed to bring support for the Snapdragon 805, 2K displays and an alphabetical order for the settings menu. The first two don't really concern existing devices, but we're sure this isn’t the complete GDR2 changelog. The update itself was expected in October, obviously that didn’t pan out. There is no information about the actual release date, but Microsoft has scheduled a Windows 10 event for January 21 (that's next Wednesday), we should learn more about WP8.1 GDR2 and Windows Phone 10 (and desktop 10) then. 820 - had a year or so, may move to android as this upgrade spee dis pathetic. Give me the iso to download, ill do it myself! !